Use this event to raise the profile of safety in your workplace: asbestos? stress? bullying? All issues a strong union presence is crucial if you want to stop them. Stop press: Welsh Housing Association Tai Calon has been fined £30,000 for heath and safety failures. The association failed to reduce workers exposure to vibration. Several workers were diagnosed with HAVS – which causes pain and loss of strength in the hands. 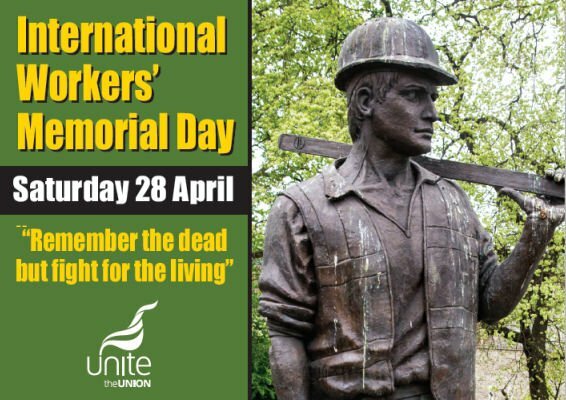 The 28th April is International Workers’ Memorial Day the day each year when workers come together and remember those who have been killed and injured at work. The slogan for the day is “remember the dead – fight for the living”. Sadly, it is all too likely that know someone who has died at work, has been injured in the workplace or is suffering from an occupational diseases.